Our new ram lamb, Moses, owes his existence to a poor banding job. 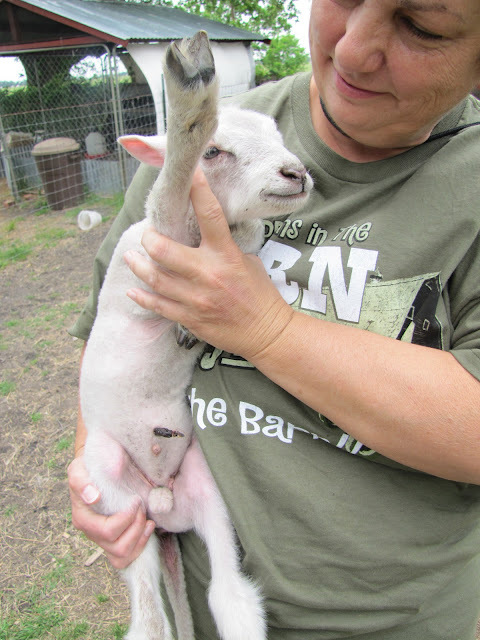 My sweet breeder, who shall remain nameless, doesn't do a great job of neutering her sheep. As a result, we had an unexpectedly fertile boy in with our ewe, Mary Elizabeth, who produced twins last week. There are several suspects, but we'll never know for sure who the daddy is. Moses has reached the tender age where we needed to perform this delicate neutering procedure, and so with Nurse Gail's able assistance, I did the deed. No more ram lamb. It doesn't look like he's going to hold a grudge. Happily, he has gained three pounds since he was born a week ago at 6 pounds, topping the scale now at 9 pounds. Rachel weighed 8 pounds today. They're growing well. I don't expect this little operation to stunt Moses too badly, but we'll keep an eye on him. In fact, he took it much better than Shadrach did three years ago - my, what a drama queen HE was. No, our little stoic did very well and dealt with the whole ordeal by taking a nap. In a few minutes he was up nursing and bouncing around just like before. Another big milestone under our belt. LOL @ "sports package" and the "TMI" label. He looks pretty happy. He'll never know what he's missing! Those bands are really cool. I remember my sister and I holding calves down and while my Uncle whipped out his pocket knife and told us to look away. Wow, girls! Sounds like we could swap some stories! I'm so glad he is doing well! And 9lbs! Can't believe he is bigger than his sis! Hmm, that is what we were doing today too. Hopefully I now have a nice spotted wether to give me lots of lovely fleece without all the drama and destruction of a ram.Your little guy is a cutie.